Have you ever wondered "what hair color will my baby have?" Humans have 46 chromosomes. Experts estimate that in these 46 chromosomes, there are about 60,000 to 100,000 genes. All babies get 23 chromosomes from their mother and the other 23 from their father. Having all the likely combinations, a pair of parents has potential of producing even 64 trillion different kids. This article gives you a slight look at how your baby will look like. The science about genetics is quite complicated, but there are ways of guiding your imagination. Your baby’s hair color will definitely be affected by the hair of its parents. Hair color can be categorized into light and dark, with the latter being the most dominant one. This is the reason why brown is the most common hair color whereas blonde is less common. This is probably one of the reasons why blonde is one of the most desirable hair colors. Many people would like to be naturally blonde. Dark hair is caused by the pigment eumelanin. The more this pigment is found in hair, the darker your child’s hair will be and vice versa. A baby’s genetic code has protein what contributes to melanin production in the baby’s hair. While the traits of genes can help predict the baby’s hair color, they do not explain why hair color changes when a person ages. Eumelanin and pheomelanin are the two types of melanin that affect the color of hair. Pheomelanin gives hair the shades of orange and yellow while eumelanin colors hair brown and black. A mixture of these two melanin types determines an individual’s hair color. Therefore, if a child has lower eumelanin concentration, he will likely have lighter hair color and vice versa. It has also been stated that MC1R genes are the ones that regulate the melanin type the body produces. 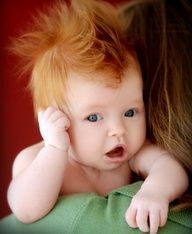 When gene mutation causes the production of pheomelanin only, the baby’s hair will be red. People with blond and red hair have higher tryosinase levels than those with black or brown hair. Generally, light hair is not dominant over dark hair. But as it is with eye color, a baby’s hair can end up having a beautiful range of shades between the hairs of both parents. It depends on the hair colors of parents and the manner in which they mix. Parents that have the same hair color can have a baby whose hair hue is slightly different but still within that color range. There are times when surprising hair colors appear from parents that have different hair colors. This normally happens when there is a recessive gene in one of the parents. A parent with black hair carrying a blond recessive gene could potentially have a child with blond hair. This happens if the blond gene mixes and is expressed with another blonde gene from the other parent. Red hair was once found to be recessive but is now more dominant over blonde hair. Your hair might have reddish hue masked by a strong black or brown pigment. As a matter of fact, a newborn’s hair does not tell what hair color your child will have eventually. Newborns with raven hair can end up being blondes while babies with blond hair might end up having brunette hair. Of course, there are babies that are born completely bald and in this case, it is close to impossible to tell which hair color he or she will have until later on. 1. The parents are carriers: As shown below, the father is blue and mother is yellow, they contribute to two possible alleles (r or R) of MC1R variants to their baby. Consequently, there is 25% likelihood that one of their children will inherit two r alleles one from each parent and thus have read hair. 2. One parent is a carrier (e.g. the father) and the other a redhead (e.g. the mother): In such a case, all their children will inherit a single r allele from the mother and thus have an equal chance to get the r or R allele from the father. Therefore, there is a 50/50 chance of their children being redheads. 3. If both parents are redheads: Their children will have redhead (rr) definitely. 4. If any of the parents does not carry the r (red hair) allele: In such a case, no matter what the other parent’s genotype is (rr, Rr, RR), there is high likelihood that they will not have read haired children. Even so, some of their kids will carry the red hair (r) allele. Red is most rare hair color around the world and black is the most common hair color. A survey done about the relationship between personality and hair color found that blondes are considered to be flirty and fun, brown haired people are found to be serious and smart and redheads are found to be strong. After chemotherapy, your hair can grow back, but there is likelihood that it will grow back in a different color that the normal hair color you first had. Each hair strand can have about 14 various elements traces, including gold. On average, people with blonde hair have the highest number of hair strands. On average, redheads have the lowest number of hair strands (about 86,000). People can use cross-sections of hair to determine a person’s ethnicity. Asian hair is round-shaped, African hair is flat-shaped and European hair is oval-shaped. In ancient Greece, it was believed that those with redheads turned to vampires after they died. In ancient Greece, blonde hair was linked to prostitution. Back in Venus’ Renaissance Era, women would dye their hair blonde using horse urine.